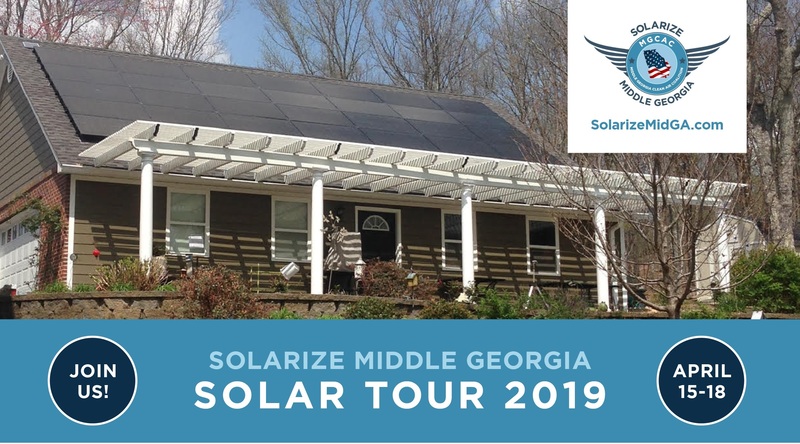 Macon, GA – Solarize Middle Georgia is holding its 2nd “Solar Tour,” including workshops and information sessions throughout Middle Georgia beginning on Monday, April 15th. The schedule is detailed in the table below. The Middle Georgia Solar Tour will travel through Macon-Bibb, Monroe, Houston and Sumter counties. The Solar Tour brings awareness to Middle Georgia residents of the new options to power their homes, businesses and nonprofits. Solarize Middle Georgia is a community-wide effort to make solar energy and battery storage more affordable and accessible to homes, businesses, and non-profits throughout Middle Georgia and runs for six months, through April 30, 2019.
Notable guest speakers at the Middle Georgia Showcase Luncheon on Tuesday, April 16th include Chrissy Miner, President of the Museum of Aviation Foundation and Senior Advisor to the 21st Century Partnership in Warner Robins, and Public Service Commissioner and Chairman, Lauren “Bubba” McDonald. Additional organizations participating in the Middle Georgia Showcase include the U.S. Green Building Council, Middle Georgia Clean Air Coalition, Sierra Club, Mercer University, Wesleyan University, Macon-Bibb Board of Education and Robins Air Force Base. The State of Georgia ranks 11th in the nation for installed solar capacity but most of the energy we use in our homes still comes from coal, gas and nuclear power plants. Community Solarize programs are working to change that. Prior Solarize programs include Tybee Island, Savannah, Athens, Decatur/DeKalb, Dunwoody, Atlanta, Carroll-Carrollton, and Newton-Morgan. Over half of the rooftop solar capacity in Georgia has been generated through Solarize programs. Solarize campaigns are supported by the U. S. Department of Energy. Additional partners or “Ambassadors” for Solarize Middle Georgia include Keep Macon-Bibb Beautiful, NewTown Macon, Altamaha Riverkeeper, The Eatonton-Putnam Chamber of Commerce, the Forsyth-Monroe County Chamber of Commerce, the Greater Macon Chamber of Commerce, the Hawkinsville – Pulaski County Chamber of Commerce, The Milledgeville-Baldwin County Chamber of Commerce, Perry Area Chamber of Commerce, Roberta- Crawford County Chamber of Commerce and Sumter County Chamber of Commerce, Twiggs County Development Authority and the Twiggs County Chamber of Commerce. For more information, see solarizemidga.com. Contact admin@solarizemidga.com for more informiton.